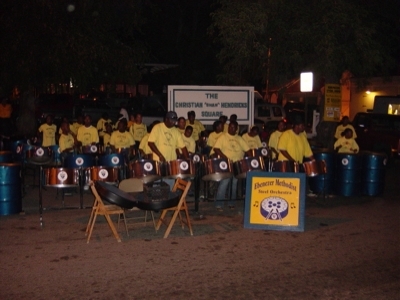 Traveled from the eastern side of St. Croix this evening into Christensted (one of only two larger towns here) for “Jump-Up” which is a unique street festival consisting of mainly steel drum bands and alot of drinking. 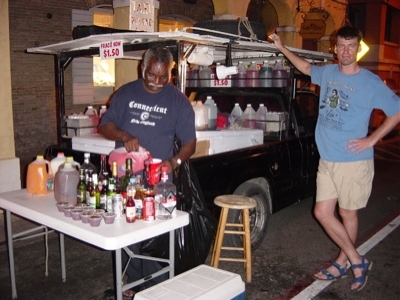 When in Rome, do as the Romans… yeah, so I had many chilled (and frozen) adult beverages. Quite tasty let me tell you. This was the first place I’ve ever been to where one could walk around and drink alcohol in the streets – or even get it made on the street, as we saw with this fellow who was running a full service bar out of the back end of his pickup. Note the presence of the current brother-in-law prospect standing against the truck. Small world, by the way, as the “bartender” of this particular establishment was from Connecticut – noted by his t-shirt. After an afternoon of this, returned to the resort and had a few more fine frozen drinks at the oceanside bar. Now I sit on my terrace overlooking the ocean with a large glass of water (to avoid the hangover you see) and ponder the day’s events. Only nine more nights of this bliss….